Whew! What a rushed few weeks, travelling to meet commitments in Johannesburg, Lesotho, London, then back to South Africa to talk to protesting students, then to Washington, back to Swaziland and finally, unexpectedly, to the Diocese of Umzimvubu. 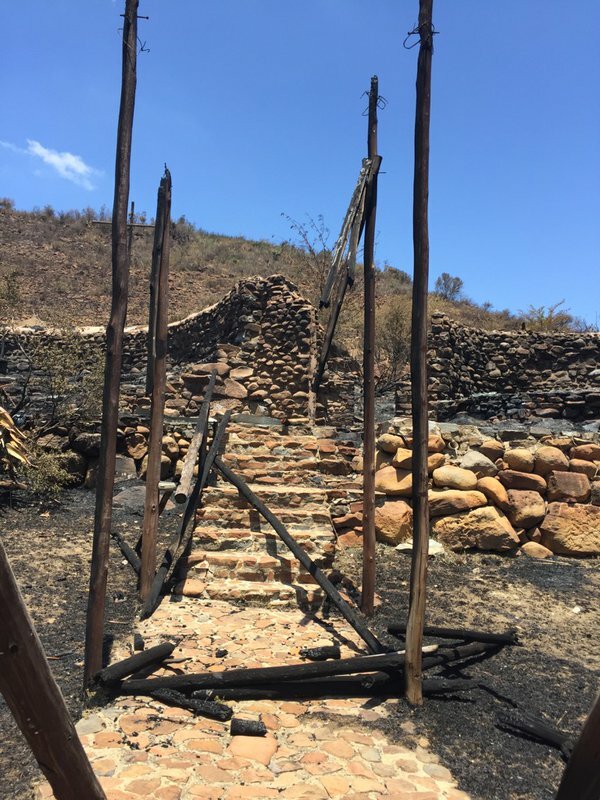 Let me start with the news that fire has devastated Umzimvubu's diocesan centre at Glenthorne farm, outside Kokstad, on the very day the Diocesan Council was meeting to plan the way ahead under the interim leadership of Bishop Sitembele Mzamane of Mthatha, who is Vicar-General while the future of Bishop Mlibo Ngewu is decided. As soon as I heard about the fire, I changed my schedule and went with the Provincial Executive Officer, Canon William Mostert, to Glenthorne. As I wrote to the bishops afterwards, before I arrived I was in denial over the extent of the fire, hoping that the reports I was receiving were exaggerated. They weren't. 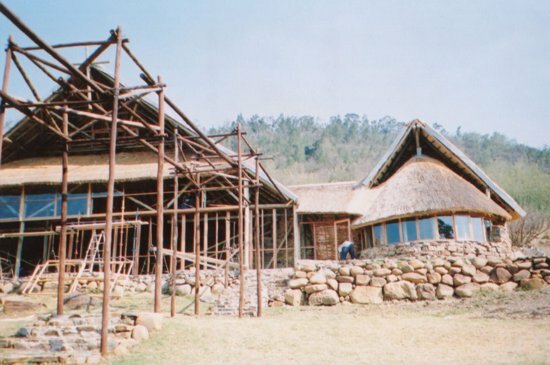 Among the buildings destroyed was the Province's only "Eco-Cathedral", made from indigenous stone and thatch, which had been razed to the ground. 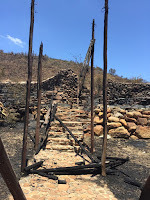 But there was a sign of redemption: a wooden cross on the sanctuary, charred but still intact. It transformed my sorrow into hope, even in the midst of ruin and destruction. We prayed with Bishop Mzamane, members of Chapter and church members, then went to the diocesan offices in Kokstad, where we held a service and introduced the new Diocesan Secretary and Treasurer, who was appointed in the wake of the Diocesan Synod in August which resolved that it wanted to make a new start, with a new bishop and a new secretary/treasurer. The fire has been reported to the South African Police Service and they have promised to investigate it. At the Diocesan offices with Bishop Mzamane. Returning to the beginning of my travels, they began with meetings of church and other religious leaders in Johannesburg, where we agreed to adjourn on one day to go to the campus of Wits University [VIDEO], my alma mater, to demonstrate our solidarity with students at the height of the #FeesMustFall protests. From there, I went to the Diocese of Lesotho, where I preached at the consecration of the new Church of St Matthias, Peka. 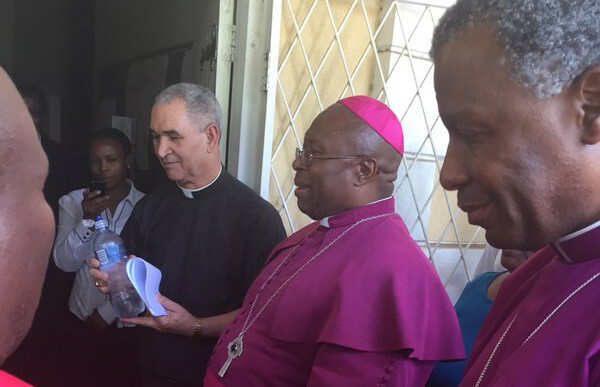 We also gave a donation towards the Mabooe Archbishop School, a new high school. The King, the Prime Minister and his deputy were all in attendance, as were visitors from Lesotho's companion diocese of Durham in England. From Lesotho, I was off to London, to the annual meeting of the Compass Rose Society, a voluntary grouping made up of generous Anglicans from different walks of life who support the work of the Anglican Communion Office in London and that of the wider Communion. Leaving UWC at 10 pm, I felt I had helped the process but that I would have liked to be able to have spent another day to consolidate the progress we had made. Deeply conflicted, I returned to the airport the next day to board another international flight, this time to fly to Washington, DC, for the installation of Bishop Michael Curry as the new Presiding Bishop of the Episcopal Church. It proved to be a wonderful occasion but soon I was on a plane back to Johannesburg. There I slept overnight and went on the next day to Swaziland, to address a Deans' Conference - where I called for Cathedrals to become "Institutions of Education" across our Province, then preached at the unveiling of the tombstones of Bishop and Mrs Mkhabela - Bishop Bernard having been the diocese's first Swazi-born bishop. But what struck me hardest in Swaziland were the effects of the drought which has inflicted on that country a crisis such as I have never seen before. In Lesotho, King Letsie III had asked that I pray for rain. Arriving in Swaziland, realised what he feared for Lesotho. Those cattle that are alive are like ghosts, those that are dead looking like bags of skin and bones along the road, some left exposed, some covered with soil. The soil is dry and cracking as a result of the rain not coming. Driving on the road to Siteki, we stopped to take a picture of a cow that had died from starvation whilst politicians slumber in wealth. My driver slowed down as a young bull crossed the road listlessly, prompting the driver to speculate that "it is waiting to die, too." Further along the road, still more heaps of soil covering carcasses as we drove along. Even goats, which are usually survivors, are few and far between. Having had some days in Cape Town to rest and recuperate, I recall that despite everything Swaziland is going through, the marula trees are still green and blossoming - conveying the message that in Christ, drought and death will not have the last word. Please help ensure that that will be so by generously giving to the Province's drought and disaster relief fund to help Bishop Ellinah and her diocese: the details of the account appear below. And please also pray for rain, not only in Swaziland but in Lesotho, South Africa and other places also stricken by drought. Pray too for the upcoming climate talks in France, which I will attend - pray for mitigation of the effects of climate change; pray that the nations of the world meeting there will adopt a binding protocol committing them to reduce emissions, and to prevent temperatures rising. As you begin your preparations for Christmas this year, you might find useful the online audio reflections that I will again be recording from the Bishopscourt chapel for each Sunday of Advent. Beginning two or three days ahead of the First Sunday in Advent, you will find them on your mobile phone or computer at: https://soundcloud.com/anglicanmediasa/ You can also download them to send to your family and friends. As I completed this letter, news came in of the Paris attacks on the night of Friday November 13th, following those in Beirut a day earlier - our prayers, concern and condolences go to all as we lament this awful tragedy. Please include the word "Drought" and your/the donor's name on your deposit slip. Account name: ACSA Disaster Relief Fund.